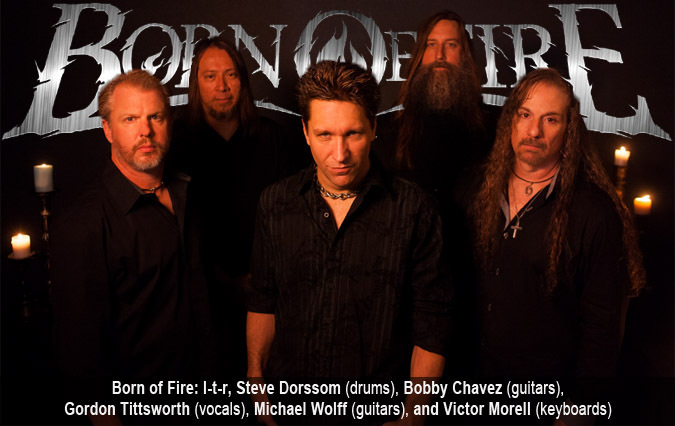 New Interview with US Metal Band--Born of Fire! The urge to create varies from person to person. In some of us, it tickles at the back of our minds saying "What if...what if...what if..."
Born of Fire recently released a new album called Dead Winter Sun, a stout release of traditional heavy metal with enough progressive elements to be intriguing to the classic headbanger. The frozen wasteland on the album cover could be metaphoric for the ten years the band has been dormant. During that dormancy, the tickles of musical creativity coalesced into the motivation to reunite and be a band again. German label Pure Steel Records took notice of their new album and signed the band straight to a contract. Time and experience have a way of making paths that eventually wind into each other. Born of Fire is a band back on the scene and extremely hungry after a decade-long hibernation. We had a chance to ask drummer Steve Dorssom and hired vocalist Gordon Tittsworth about the process and pressures of creating an album with members who've never met each other, the pleasures of acting, directing and film making; and something we all love--hot sauce.